Briton Simon Guest only has 90 minutes. That's the turnaround time between jumps in the FAI World Air Games 4-way Formation Skydiving competition. 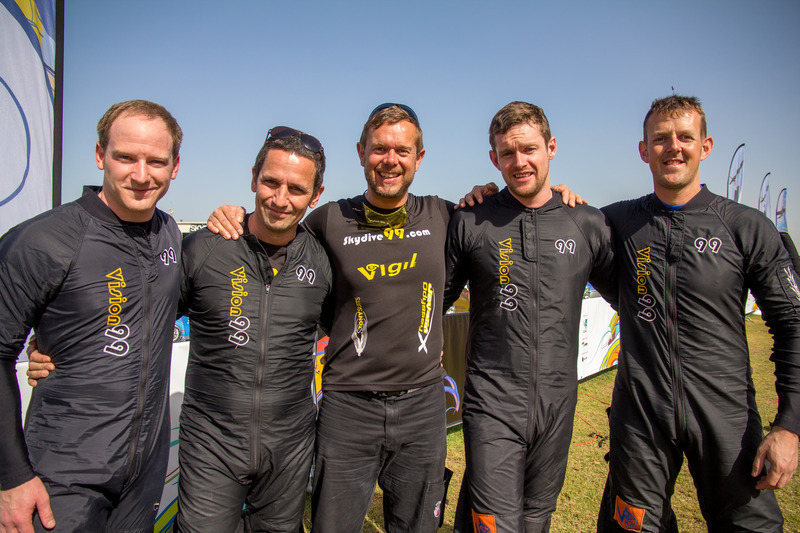 Along with teammates Mike Hayes, Pete Mather and Ady King, they have just completed one of ten 35-second runs in which they managed 18 points. "We're a bit disappointed, because we had a couple of busts," says Guest. The team has been jumping together for four years, but has a new cameraman, Jed Parker, who's learning how they fly. Parker has a tricky job, because as the team spins around, linking into different formations as they freefall to earn points, he has to stay far enough away to film it all, but close enough to see all the hands gripping. They only score points if all the grips are held at the same time and if they're captured on film. Parker missed a couple. The footage is handed to judges who score it on the big screen for the stadium of spectators to appreciate. "You think it through in your mind as you're packing," says Guest. "But then you move on, forget about it, focus on the next jump. "We watch the jump on the big screen, but we don't look over footage to review it until the day or the competition is over." They then have a go on the creepers, skateboards with casters that allow them to practice their routine (seen here being used by a rival team). Each heat has a different set of formations to be performed in order. It has to be memorised by all the team members, and any problems moving from one to the next worked out. Formation skydivers wear special overalls with "grippers" sewn on to the arms and legs to act as a hand rail for others to hold. In the air, they have to be careful not to pass on energy to their team-mates as they connect with each other. "You can knock someone off balance if you transfer energy during a transition," Guest explains. The Brits may not be at the head of the pack, but they're in a fierce battle with the Australian team for seventh place. Midway through the competition the British team is slightly ahead, but they've jockeyed for position after each round. The Australians narrowly lost out in 2014, and the rivalry, although competitive, is friendly. There are 15 minutes to relax before the team are chauffeured to the Twin Otter aeroplane for takeoff. "It's quiet in the plane," says Guest. "We spend the 15-minute flight visualising the jump. There's no talking. We've done all the prep work on the ground, so it's time to be calm and relaxed. It's not like a flight on a normal skydive when everyone is talking and joking." Their clock is running as soon as they leave the plane, so they link up in the first formation before exiting. Then the 90 minute cycle starts all over again.